Preheat the oven to 200° F. Have an ovenproof serving platter or baking dish ready so you'll be able to keep the prepared pancakes warm in the oven. In a large bowl, whisk together the matzo cake meal, potato starch, sugar, and baking powder. Make a well in the center of the dry ingredients, and add the milk, eggs, melted butter, and vanilla. Whisk well until the ingredients are well-combined and the batter is smooth. Place a large skillet over medium-high heat. Grease the skillet and with a little oil or butter. Drop the batter by spoonfuls (about 2 to 3 tablespoons each) into the skillet -- depending on the size of your skillet, you should be able to make 3 to 4 pancakes at a time. 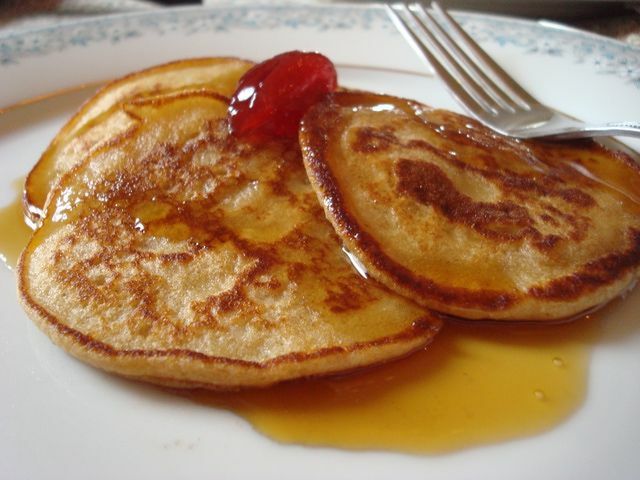 Allow the pancakes to cook for 1 to 2 minutes, or until the edges are set and you begin to see bubbles on the surface. Use a wide, thin spatula to carefully flip the pancakes, and continue cooking for 1 to 2 minutes more, or until golden brown on both sides. Transfer the cooked pancakes to the platter, tent with foil, and keep warm in the oven while you make the rest of the pancakes. For the peach compote: In a medium skillet over medium heat, melt 2 teaspoons unsalted butter. Add 4 cups canned peaches. Bring peaches to a bubbly stage and then stir in 3 heaping tablespoons of brown sugar. Turn heat to warm and continue warming until pancakes are done. For the maple brown sugar butter: In a small mixing bowl mix together butter, brown sugar, maple syrup and cinnamon. This works best if you use an electric mixer. Set aside.